A: The Chinese people are concerned by the blasts that recently took place in Sri Lanka's capital Colombo and other cities. In this time of grief, we stand firmly with the Sri Lankan people and resolutely support the country in upholding its national security and stability. We strongly condemn the attack and express our deep condolences to the victims and sincere sympathy to the injured and the bereaved families. I'd like to stress again that we will work with the international community, Sri Lanka included, to enhance cooperation in counter-terrorism and safeguard peace and stability of the region and beyond. According to the information I have, one Chinese citizen was killed and five were missing in the incidents. Five injured Chinese are now being treated in the local hospital, and two of them were seriously injured. After the blasts took place, the Chinese embassy kept in close contact with the Sri Lankan side. 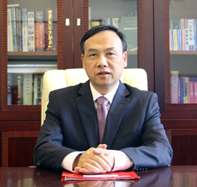 The Chinese ambassador had talks with the Sri Lankan Prime Minister and Speaker of the Parliament on the resettlement of and the follow-up work regarding the Chinese citizens who were injured, killed or missing. 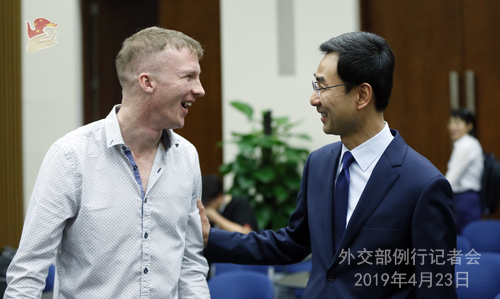 The Sri Lankan side said it would do its best to coordinate with China in the identification, rescue and treatment of Chinese citizens and the related follow-up matters. 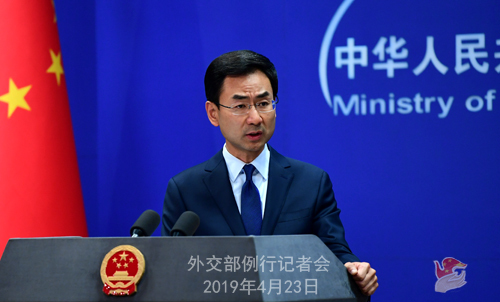 After the incidents, the Chinese foreign ministry issued a safety reminder at the earliest time possible for our citizens, advising them to not travel to Sri Lanka for the time being, and to take more precautionary measures and keep away from the crowds for safety reasons if they are already in that country. What the US did will inevitably add more instabilities in the Middle East and the global energy market. We urge the US to act in a responsible manner and play a constructive role instead of doing the opposite. Besides, as an important oil producer, Iran's crude oil export is of great significance to the stability of the global energy market. The relevant US sanctions will inevitably add more instabilities to the international energy market, just like what happened in the market yesterday that you may have noticed. We advise the US side to act in a responsible manner and play a constructive role rather than doing the opposite. A: To answer your first question, after the blasts, the Chinese foreign ministry issued a safety reminder at the earliest time possible for our citizens, advising them to not travel to Sri Lanka for the time being, and to take more precautionary measures and keep away from the crowds for safety reasons if they are already in that country. We will release new notifications when there is need to change the earlier reminder. 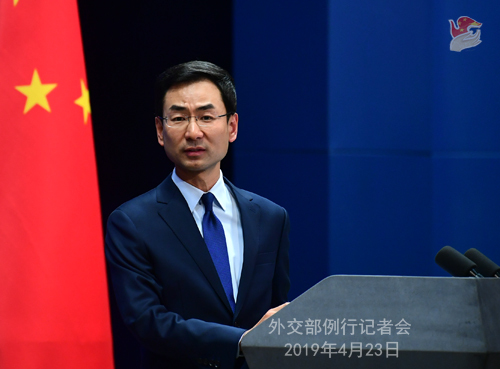 Regarding your second question, President Xi Jinping, Premier Li Keqiang and State Councilor and Foreign Minister Wang Yi sent messages of condolences to the Sri Lankan side after the blasts. We strongly condemn this attack and express our deep condolences to the victims and sincere sympathy to the injured and the bereaved families. At this very moment, we stand firmly with the Sri Lankan people and resolutely support the country in upholding its national security and stability. As for the specific arrangements you asked about, I'd refer you to the competent authority of the Chinese side for more information. A: We welcome Prime Minister Imran Khan's participation in the second Belt and Road Forum for International Cooperation in China. Like you said, the China-Pakistan Economic Corridor (CPEC) is an important flagship project of the Belt and Road cooperation. With the joint efforts of our two countries, the CPEC has yielded a lot of concrete outcomes and delivered tangible benefits to our peoples. We have every confidence that China and Pakistan working together will make more stable and sustained progress under the CPEC and more benefits will be felt by the two peoples. The cooperation under the CPEC, exemplary as it is, provides valuable experience for us in the Belt and Road cooperation with other countries and regions. The opening ceremony of the second Belt and Road Forum for International Cooperation will be held on April 26, Friday. The regular press conference will be adjourned on that day and resumed on April 29, Monday.